When you subscribe to Nuts & Volts — Print Edition, unlike other magazines, you also get full access to our Digital Edition at no extra charge. So, YOU can choose how you want to read your issues! Some readers prefer a paper copy they can hold in their hands or keep on their bench. But if that’s not you, then get the Online Only Edition and save a few trees and some cash. Just review the options below and click SUBSCRIBE to make a selection and place your order. Easy! 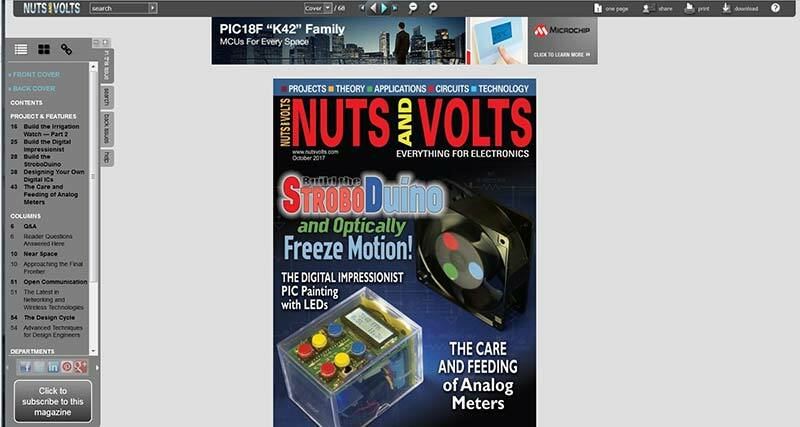 If you’re a subscriber and your subscription includes this issue of Nuts & Volts, you can read this article in our digital edition by clicking the blue icon in the upper right corner. Use the email address associated with your subscriber services account to login. If you're a member of our Preferred Subscriber Network, not only will the magic blue icon let you read this article, but EVERY article in EVERY issue is yours to enjoy! Over a decades worth of content is stored in our digital archive! If you’re not a subscriber, you can still view a few sample pages of our digital edition or subscribe here for full digital access and/or print delivery. Also, as you browse around our site, you will find selected articles have been posted in their entirety for you to enjoy. Selected questions from past Q&A columns. Wire Wrap Is Alive And Well! What The L Is It? Need to brush up on your electronics principles? These multi-part series may be just what you need! Small Logic Gates — The building blocks of versatile digital circuits. April 13 - A Night at the Opera? Does Inductor Winding Have You Tied in Knots?